Are White Veins Caused by a Virus? Does a Virus Cause White Veins? 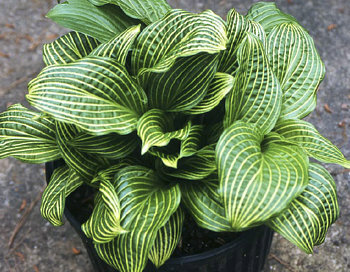 It was back in 1997 that Americans saw their first white-veined hosta. 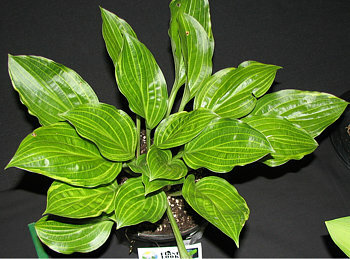 A division of 'Amime-no- Tachi', an H. rectifolia selection from Japan, was donated to the auction at the AHS convention in Portland, Oregon by Bette Comfry, who was then the proprietor of Silvermist Nursery, one of the best hosta specialty nurseries of its day. The high bid on it was $1,550. Soon after, the plant was thought by many to appear unhealthy and so was tested at AHS expense and found to have an unknown virus. The plant was then replaced with another of the same variety brought from Japan, and Mrs. Comfry reimbursed the AHS for the refunded money. The following year, both the infected one and the healthy one were on display in the auction winner's garden, which was on tour for the AHS convention in Indianapolis. The virus- infected plant showed much of the white-veined look, while the healthy replacement plant was mainly just green. The photo, at right, shows the virused plant as it appeared on that tour. The presence of an unknown virus in that first white-veined plant led many to reasonably suspect that the white veins in 'Amime-no-Tachi' were a symptom of virus infection rather than some new mutation. Their caution was well placed, as the HVX epidemic began a few years later and virus-caused symptoms quickly became the biggest news of the new century. To this day, nurseries have been wary of propagating white-veined plants because of the possibility that the variegation might be caused by a virus or other pathogen. During this time, W. George Schmid had a division appear on an H. rectifolia seedling with a very similar look. He named it 'Gosan Line Up'. This plant caused quite a bit of discussion at the time, but eventually lost its variegation, becoming simply another plain-green seedling. George writes about it and some other white-veined plants in the H. rectifolia Pt. 2 segment of his thorough and scholarly species descriptions found at the HostaLibrary. It did lose its variegation by the time of the study, but was included in the test because if a virus was responsible it should still be present in the plant. Next to arrive on the American hosta scene was 'Mito-no-Hana', a smaller sieboldii derivative with even better and more stable vein marking. 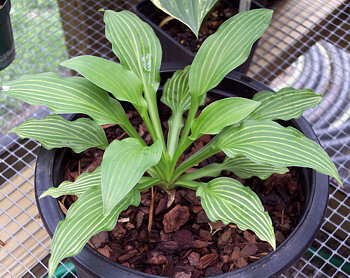 It also came from Bette Comfry's collection of Japanese hostas. Bette had lost her husband and her own health was beginning to fail, so she closed Silvermist in the late '90's. She offered her Japanese collection to Van Wade, where the plants are today. The first pieces of 'Mito-no-Hana' began to become available shortly into the new century. It's first appearance in an AHS convention auction in 2005 brought a winning bid of $1,000 from Bob and Barbara Tiffany, who featured it in their garden when it was on tour for the 2006 convention. Seedlings from it are reported to not show the white veins. In 2009, Stan Megos, proprietor of the Variegated Foliage Nursery, entered a new white-veined sport that he had found at the nursery in the First Look Seedling and Sport Competition and won the Frances Williams Award with it. He decided to name his find 'Yikes Stripes'. It is a chance seedling of unknown heritage, but appears to resemble H. yingeri. He plans to make it available soon. Also, in 2009, word began to circulate about the most exciting white-veined plant to date, a 'Honeybells' sport found on his large old clump by Gerry Bennet that he calls 'Second Coming'. Gerry is a friend of hybridizer, Rick Goodenough, and Rick mentioned the plant on Rod Kuenster’s Hosta Seed Growers forum, causing quite a stir when he later showed pictures. There is much interest in this plant, and it was auctioned once for fundraising and fetched $310. My bet is that 'Second Coming' will be the first white-veined hosta to become widely available - if the appearance isn't caused by a virus. The latest to appear was Deb Abrams' 'Electric Love', which made its debut at the 2010 First Look meeting. It appears to be yet another H. rectifolia sport, and the variegation appears to be more of a yellow color than the others. Deb is still considering what to do with this one and has not yet shared a piece. These six plants are, as of this writing, the best known of the white-veined types, but others have appeared here and there with less fanfare. It is possible none of those survive, as of this writing. Some were, no doubt, destroyed because of the danger that they could be infected with some as-yet-unknown virus or other pathogen. A white-margined plant with white veins turned up in the late 1990's, but hasn't been seen or talked about since. Over the years we've had a few of these white-veined plants being donated to the First Look Online Auction that we run every winter. They've been something of an issue each time because those who thought the variegation might be caused by a virus were concerned about them being auctioned. Certainly they had a point; the cause was unknown and did bear some resemblance to the symptoms of the "vein clearing" group of viruses. It was a difficult decision, but we did decide to include them in the auction because there was no proof of any kind that a virus caused the pattern, and because there were real differences between what we saw in these hostas and the vein clearing symptom. In the latter plants, the veins appeared a translucent greenish yellow, about what you'd expect if the chloroplasts were destroyed. 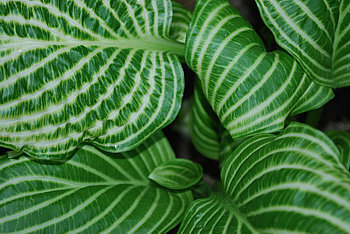 In these hostas, the veins were an opaque white or cream color, indicating the presence of white and yellow pigments, and, further, they usually "greened up" during the season with their best color early in spring. That would require "repair" if the cloroplasts had been destroyed- an unlikely scenario. These observations seemed to strongly indicate that it was a mutation of some kind, and not disease symptoms. Still, the question of a virus remained on the table, so I organized a study in which Dr. Ben Lockhart, one of the world's top plant virologists, would investigate it for us. This study was funded by Region One of the AHS. This past July, I sent a sample of 'Amime-no-Tachi'; Rick Goodenough sent 'Second Coming'; Debra Abrams sent 'Electric Love'; Rod Kuenster sent 'Mito-no-Hana'; and George Schmid sent the now-green 'Gosan Line Up'. We were unable to obtain a sample of 'Yikes Stripes', but the five would serve for the first tests. After just a few days, I received word from Dr. Lockhart. What he had to say should lay the question of the white veins being caused by a virus to rest. He prepared samples from the leaves that were sent and viewed them under the electron microscope at the University of Minnesota. The remarkable magnification produced by an electron microscope is capable of would clearly make visible to Dr. Lockhart's trained eye any virus particles present in the samples. It wouldn't matter whether the virus was an unidentified new one or one he was familiar with; any virus present would be visible. "Leaf samples of the following hosta cultivars were received last week and were tested for presence of virus by transmission electron microscopy (TEM), using partially-purified leaf tissue extracts prepared by ultracentrifugation. No viruses of any kind were detected in the first four samples. The sample of 'Amime-No-Tachi' contained a high concentration of filamentous virus particles, identified as those of Hosta virus X (HVX), by enzyme-linked immunosorben assay (ELISA). No foliar nematodes were detected in the necrotic tissue along the petiole and some lateral veins of this sample. The results obtained suggest that the presence of white veins in these host genotypes are probably not associated with infection by HVX or any other virus. I hope that this information will be of use to you, and I would be very happy to provide any additional information on the virus testing procedures used. These results indicate that, in the samples provided, which are five of the six better-known white-veined hostas, there are no virus particles of any kind to be found, save one plant which was infected with HVX. The HVX-infected plant has never shown any of the known HVX symptoms, and is very likely a division of that very first 'Amime-no-Tachi' plant that was found to have a virus. 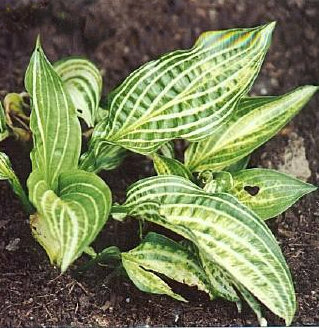 The infected plant traces back directly to that one, indicating that that initial test probably was the first discovery of HVX in a hosta. Because nothing was found in the other samples, each of which, save 'Gosan Line Up', was well variegated, it seems clear that the white veins are not caused by any virus known or unknown. The source of this variegation remains a mystery, but is apparently the result of a mutation of some kind. Curiously, two attempts to tissue culture 'Amime-no-Tachi' failed to produce any variegated plants. Even after a few years of growth, no white veins appeared, yet normal division has always resulted in variegated plants. As of this writing, there is a rumor that another white-veined hosta is being TC-ed. 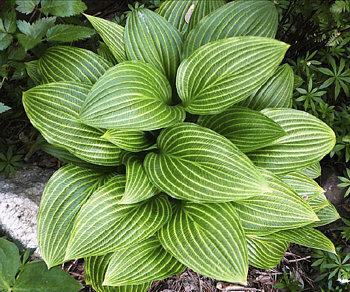 If it also fails to produce variegated plants, the white-veined hostas may forever remain the stuff of collectors' desires.